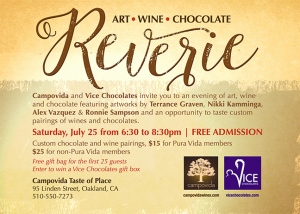 Join I-Li Chang, Vice Chocolates’ chocolatier, for “Reverie,” a wine & chocolate pairing event/art exhibition at Campovida Taste of Place Oakland wine bar, July 25, 2015, 6:30-8:30pm. 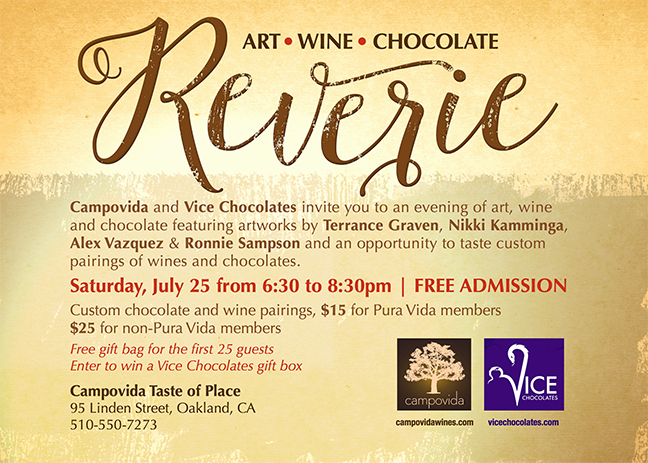 Vice Chocolates truffles, including a new custom truffle, will be paired with 3 wines from Campovida’s winery. During the evening event, four artists, Terrance Graven, Nikki Kamminga, Ronnie Sampson, and Alex Vazquez, will be exhibiting artwork tied to the night’s theme: Reverie.